Join us this weekend for the third test of Eternal‘s in-game tournament system: Envoys! Envoys consists of two stages: Qualifiers that are open to all players across platforms, and the Finals that will feature the top 64 players from the Qualifiers. All players across devices can participate in Envoys. The Qualifiers begins on Friday, November 2 at 4 pm MDT (22:00 UTC) and will end on Saturday, November 3 at 4 pm MDT (22:00 UTC). Each run consists of 7 games with the same constructed deck, win or lose. You can switch decks between runs, but not between individual games in a run. Your first 4 runs will determine your position on the event Leaderboard. Each run costs 300 Gems or 4,000 Gold to enter. The Finals begins promptly at 11 am MST (18:00 UTC) on Sunday, November 4. There will be a five-minute break between games in each match, and a short delay between the last active game in a round and the start of the next round. Each run will award prizes based on your number of wins, with a minimum of 4 packs of The Fall of Argenport per run. Leaderboard prizes will be delivered upon conclusion of the Finals. 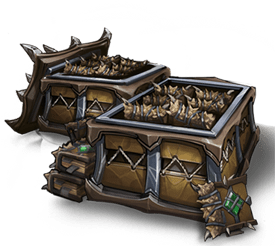 Players who finish in position 65+ in the Qualifiers will receive prizes based on the Leaderboard, with a minimum of 2 packs of The Fall of Argenport. Join Eternal game designers Luis Scott-Vargas and Patrick Sullivan for broadcast coverage of the Finals on Sunday, November 4 at 11 am MST (18:00 UTC), live on Twitch! Get ready to take your favorite deck into battle in Envoys!